Recipe from The Calories In, Calories Out Cookbook: 200 Everyday Recipes That Take the Guesswork Out of Counting Calories—Plus , the Exercise It Takes to Burn Them Off, copyright © Catherine Jones and Elaine Trujillo, 2014. Reprinted by permission of the publisher, The Experiment. Available wherever books are sold. To make the sauce, heat the oil in a very large nonstick saucepan over medium-high heat. Add the onions and sauté for 2 minutes. Add the garlic, Italian seasoning, and oregano and sauté for 30 seconds, then add the zucchini, red bell peppers, eggplant, mushrooms, and a sprinkle of salt and pepper. Cook, stirring occasionally, until the vegetables are soft, about 7 minutes. Add the pasta sauce and tomato sauce, stir well, and remove from the heat. To assemble the lasagna, spread a heaping 1 cup (250 ml) of the sauce over the bottom of a deep 9 x 9-inch (23 x 23 cm) square baking dish. Cover with some of the lasagna noodles. Break some of the noodles lengthwise to fill in any gaps on the sides of the pan. To bake, center an oven rack and preheat the oven to 375°F (190°C). Cover the lasagna with a piece of foil and bake for 45 minutes (or slightly longer, about 15 minutes, if coming straight out of the refrigerator). Remove the foil and bake for 10 more minutes, or until a knife inserted into the middle of the lasagna indicates soft noodles and most of the sauce has been absorbed. Remove from the oven, cover with foil, and allow to rest for 15 minutes before slicing. You should have about 7 cups of vegetables diced small or sliced, which will shrink down to about 4 cups after cooking. To make things really easy, use jarred tomato sauce, to which I add some canned tomato sauce. Your total amount of sauce plus cooked vegetables should be about 7 cups. To keep the calories at bay, the amount of mozzarella cheese is on the low side. If you’re not concerned with calories, feel free to add more mozzarella or your favorite cheese. 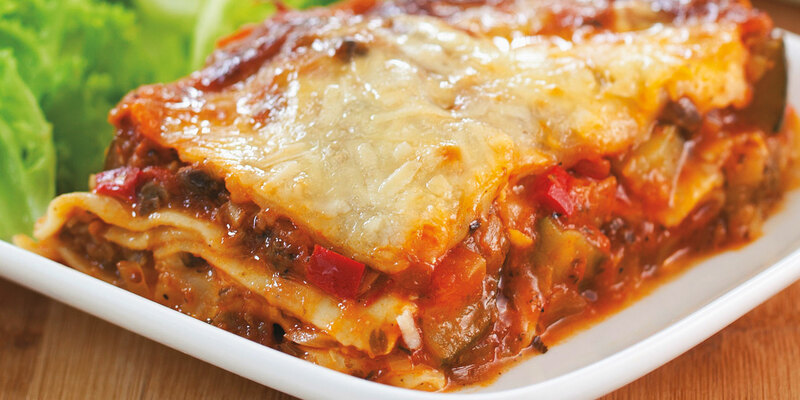 The lasagna can be assembled up to 12 hours in advance and refrigerated before baking, and the baked lasagna freezes well for weekday dinners.